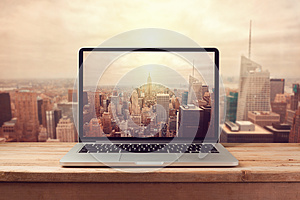 Laptop computer over New York city skyline. Copyright © 2000-2019 TimelineImages by Dreamstime. All rights reserved. Dreamstime.com LLC, is not affiliated or associated in any way with Facebook Inc. or the Facebook.com website.